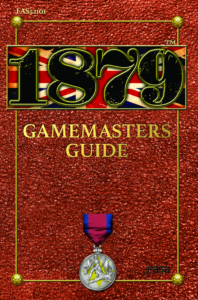 1879 RPG GM’s Guide – FASA Games, Inc.
From secrets of Her Majesty’s government, to descriptions of secret societies, to details of the inventions of the age, the Gamemaster’s Compendium delivers a wealth of knowledge and information for the gamemaster to incorporate into their 1879 campaign. Contained herein are the game mechanics for traps and poisons, Engine hacking, airships, horses and other mounts, and gamemaster characters, including a roster of pregenerated characters ready for use. Delve more deeply into the alternate history, challenge your players with complex, ongoing plotlines, and let slip clues of nefarious doings that will require true heroes to oppose and bring the scoundrels to justice! We’re Kickstarting this book, and expect to have it available in PDF in March 2017 and softcover in April!